Poor sanitation poses a very real threat to scores of communities throughout East Africa, where issues relating to personal hygiene often account for more child deaths than malaria, AIDS and measles combined. 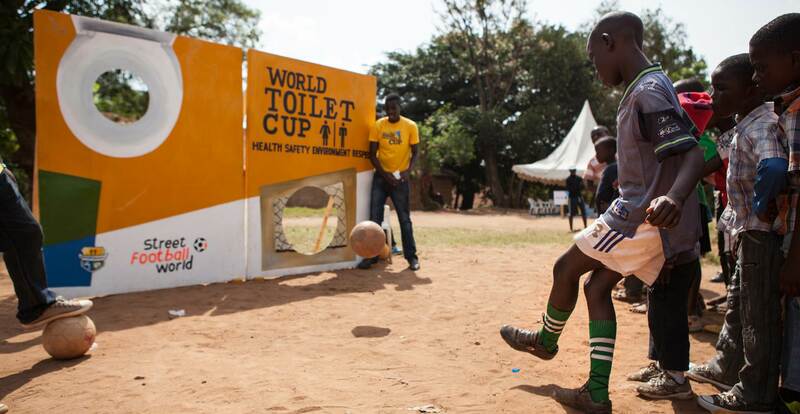 Addressing this concern, streetfootballworld teamed up with WASH United in 2014 to disseminate innovative Water, Sanitation and Hygiene (WASH) interventions for young people in need. What resulted was an ambitious initiative that attracted more than 20,000 participants and educated them on WASH topics through football-based trainings. With financial support from the German Ministry for Economic Cooperation and Development (BMZ) and the Bill and Melinda Gates Foundation, the project kicked off in Kenya, with the streetfootballworld East Africa Festival – a weeklong event that used football as a tool to promote health and social development. This was followed by a series of spectacular roadshow events across Rwanda, Uganda and Kenya, each of which culminated in workshops aimed at empowering local NGOs to deliver effective interventions in their own communities.